"[It is] the most amphibious piece of creation that I have yet had the happiness of beholding. It would be difficult to define it truly by either the name of land or water, for 'tis neither liquid nor solid but a kind of mud sponge floating on the bosom of the Altamaha." Butler Island was an inhospitable place -- hot and steamy, a breeding ground for malaria-carrying mosquitoes. No place for a woman in Fanny Kemble's station in life. Her husband, Pierce Butler, had recently inherited the island, and on the island was his plantation, complete with several hundred slaves. It was no wonder that Pierce wanted to keep Kemble, a staunch abolitionist even before they met, away from the plantation. But she wanted to see firsthand how the slaves lived. At first he refused to let her come, giving the excuse that the house on the island was too small to accomodate her, the children, and the childrens' nurse. Eventually, though, he relented, and in December of 1838, the entire family, including their Irish nurse, set out for the island. 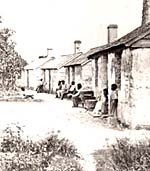 Kemble had been told that the slaves were well-treated, that they were never sold, that they were content. At first this seemed true. This opinion quickly changed, however, after she visited the various settlements on the island. She complained in her journal that the slaves' dwellings "were filthy and wretched in the extreme." The slaves lacked tables and chairs and knives and forks, and ate their meals with crude wooden spoons. She discovered that slaves were sold out to work on distant plantations. The slaves were not exempt from harsh punishment, either. One slave, asked by Kemble why the children were not kept clean, replied that there wasn't enough time. The slave was later whipped by the overseer for her "impudence." Other slaves as well felt the sting of the lash after complaining to Kemble. Even pregnant women were whipped. News of Kemble's sympathetic nature spread among the slaves, and soon she was listening to more of their stories. Kemble passed on complaints to her husband and otherwise spoke on behalf of the slaves. He claimed they were liars. Kemble continue to speak out for the slaves. In her journal she tells of a heated agument over a lashing, in which she lectured her husband of "the manifest injustice of unpaid and enforced labor," and of "the brutal inhumanity of allowing a man to strip and lash a woman, the mother of ten children." Pierce Butler eventually had enough. He forbade his wife to speak on behalf of any slaves. Kemble's observations regarding the slaves were not limited to floggings and living conditions. She noticed at their other plantation on St. Simons Island, that there was a larger percentage of mulatto slaves than at Butler Island. Her husband told her the reason was that white men had easier access to the plantation. There was one slave, she remarked, that "was the exact image of Mr. King." Roswell King and his son, Roswell King, Jr., were two whites who had mangaged the Butler plantations for years. Through the years, slaves had bore them a number of children. Roswell King Jr. had even raped the wife of the plantation's most prominent slave -- a black overseer named Frank. Of Frank, Kemble wrote, "I see that man. . . looking, with a countenance of deep thought. . . over the broad river, which is to him as a prison wall. . . . I marvel what the thoughts of such a man may be." Fanny Kemble could do little to better the lives of the slaves during her short, 15-week stay on Butler and St Simons Islands. More effective in the fight against slavery was the publication of the journal she kept during those weeks, entitled Journal of a Residence on a Georgian Plantation.